The Bacteria Filter is the perfect filter or prefilter to use as the first filter in your under-sink filter system or by itself on your counter-top. It will remove up to 99.99% of all sediment, bacteria, fungus and algae. It also contains activated carbon to remove heavy metals, chemicals and improve taste. The Bacteria Filter consists of a sturdy housing and an easily-installed ceramic, bacteria removal, filter [called CM-01 Ceramic]. The sticker on the front of the housing is easily removable, making it a neutral color to go with any decor. 1) The regular counter-top set-up includes a diverter to hook to your faucet, hosing and a spout. 2) The under-sink set up comes with 1/4 inch hosing, installed fittings and a Tee to hook directly to your cold water line under the sink. It does not include a filter faucet or spout, which you will need to purchase yourself. Filter faucets can be found at hardware stores in their water filter sections. The ceramic filter is washable [with an ordinary Scotch-Brite-Pad] and can last up to 2,000 gallons! Note: The filter is shipped inside of the housing, but is factory wrapped. So, the wrapping will need to be removed and then filter installed correctly before use. The patented dual-ceramic is made of environmental-friendly 100% natural ceramic and compared to other ceramic filters will filter sediment, suspended particles and biological matter even better than commercial ceramic filters. The filter media is designed to last an average family over a year! The CM-01 ceramic is designed to last even longer! You can clean the ceramic to renew it if at any time the filter's flow-rate slows down. Remove the product from the box. Carefully remove the pieces from the base: spout, housings and the wrapped filters from inside the housings and set all in a safe place. Leave the hose intact and just disconnect it from the faucet diverter. Save the diverter. Unscrew the spout fitting from the base and set it aside. 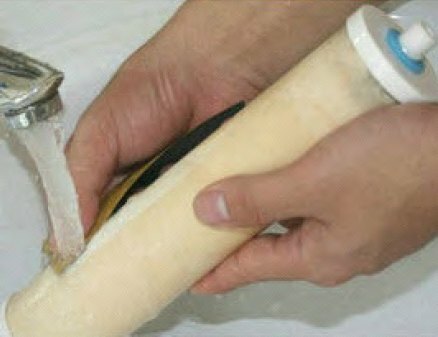 Using plumber’s tape, wrap the tape around the threads of one of the fittings about 6 times around. Smooth out any rough edges. Screw the fitting into the base [where the spout fitting was removed]. Push the loose hosing into the quick-connect fitting that you just screw into the base. You are now ready to hook the two ends of hosing into the filter faucet and Tee which you will need to purchase separately [locally]. You will need a Tee to insert your ¼ inch hosing into the cold water line [between your cold water shut off and your faucet feed line.] Here's a link to our Tee, which we have found to be the best and easiest one to use.